Decades of research links excess body fat to insulin resistance. 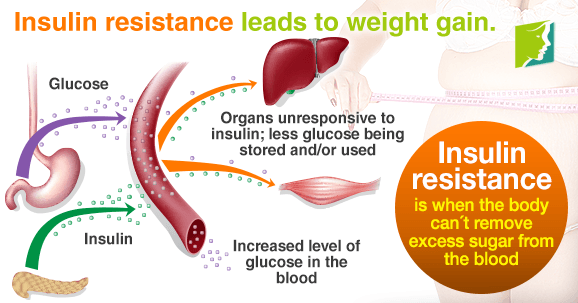 This resistance occurs when the pancreas produces insulin that is not used properly by the cells. Under normal conditions when blood sugar levels rise after eating, the pancreas secretes insulin that allows the cells to take in and use glucose (sugar) for energy. When cells become resistant they don’t respond to insulin. Excess glucose builds in the bloodstream and is eventually stored as fat. This triggers carbohydrate cravings and fatigue because the cells are literally starving for the fuel and energy they need to function. Giving in to the carbohydrate cravings result in weight gain, and the vicious cycle continues. Why is insulin resistance (also known as type 2 diabetes) on the rise? Think back in time. Our early ancestors obtained whole foods from the environment and expended a lot of physical activity to do so. Today we consume processed foods laden with sweeteners and no longer have to forage for our food. Ghrelin signals the brain with hunger and leptin signals satiety. The problem with all the high-fructose corn syrup and table sugar we consume is a reduction in circulating leptin concentrations and we never experience feeling full. In addition, a ground-breaking study released in June 2013 found that when people with insulin resistance were given a sugar drink, the brain secreted a lower than normal amount of dopamine in one of the major pleasure centers of the brain. Dopamine is one of those “feel good and do good” neurotransmitters. When dopamine production decreases, feelings of anger and hostility increase and higher blood pressure follows. Fortunately, insulin resistance is something we can both prevent and reverse through diet and exercise. The Diabetes Prevention Program and other large studies have shown that people with pre-diabetes or type-2 diabetes can make improvements by losing just 5-7% of their body weight and walking 30 minutes daily. 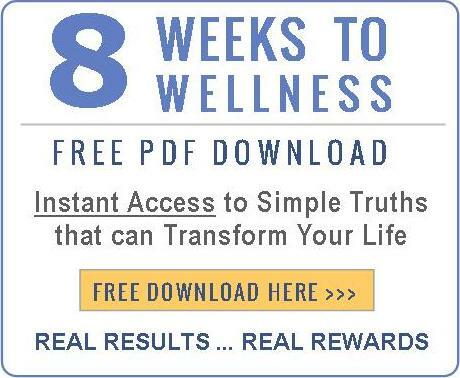 Learn more about insulin resistance and more by joining an IN.FORM group in your area. Ultra Therm and Sweet FX are designed to help keep blood sugar in the normal range, while increasing the calorie burn rate and creating satiety.